The Russell Hobbs 23200 3.5L Slow Cooker is the answer to easy and convenient cooking, giving you ultimate tenderness and maximum taste. If you have a busy day ahead simply prep your ingredients and pop them into your slow cooker and a delicious meal will be ready and waiting for you when you arrive home. You can do so much with a slow cooker, everything from succulent, juicy stews and hearty hotpots to cakes or even porridge with next to no effort! This Russell Hobbs Slow Cooker has a large 3.5L litre capacity ensuring you will always have enough space to cook for the entire family. 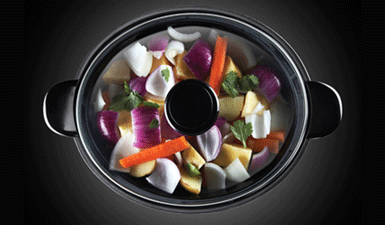 The Russell Hobbs 23200 Slow Cooker has 3 different heat settings; high, low and keep warm. This allows you to tailor the temperature to what you are cooking resulting in succulent, tasty meals. Also the keep warm function is perfect for a hot buffet at parties and special occasions. For ease of use and practicality the Russell Hobbs 23200 has a removable cooking pot which allows you to easily remove and serve food to the table. It’s also dish washer safe for easy cleaning. The non-slip feet ensure the product sits firmly on the worktop and doesn’t slip around when in use and the clear glass lid allows you to easily view your food whilst cooking. The power indicator light lets you know when the slow cooker is turned on and the cool touch handles allow you to move or stabilise the appliance when needed.